it’s a nice way to turn a meal into something special… we really enjoy everything, including the preparation… it’s a party! The fillings looks so insanely irresistible. Wow, these look fantastic! I think I would almost definitely prefer this to more fussy – and frankly, cacophonous – coulibiac (or kulebiaka, if you’re a stickler for origins). I looooove the addition of the crab and cream cheese. So unctuous! Lovely, just lovely. I will say however, because I’m a crab myself, that I kind of cringe whenever people attach names of famous dishes to recipes which are NOT that dish, as if the suffix were a signifier to be applied to any foodstuff with a remote similarity. I mean, why not call this “Salmon Empanadas”? “Pasztecik”? “Pirozhki”? “Beef Wellington” includes, aside from the eponymous beef, a duxelles, foie gras pâté, paste (I use a short paste for the base, which soaks up juices, and puff for the top), etc. 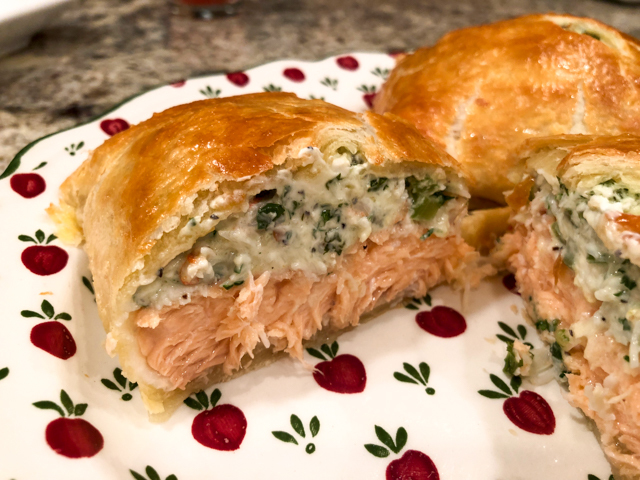 Calling this salmon dish “Wellington”, delicious though it might be, is…well, I think it’s one of the signs of the Apacalypse, right? I mean, look it up. I’m pretty sure it’s in the Bible somewhere. In the back, with the 9-headed horses and stuff. See? When even a dermestid beetle takes objection to something, you know it’s serious! Of course….I’m really just complaining out of frustration that I can’t eat these right now. Damn you. DAMN YOU FOR TORTURING ME AGAIN! and that dish you mentioned? kulebiaka? I had it once made by a Polish woman in Paris (yeah, I am fancy like that sometimes, what can I say?) – I’ve always wanted to try and make it myself. And, another one I’ve never made but it’s on the list… gravlax…. I can’t eat it because I’M NOT WITHIN WALKING DISTANCE OF YOUR HOUSE. Rectify that for me, will you? Lol! Ok, the “a la” changes everything. Well done! Oooo, you had real kulebiaka made by a real Polish woman! I think the original dish was Russian if I recall (legend being that Escoffier used to cook for Russian soldiers/sailors at his first French restaurant, learned it from them, then added a few French twists (ie: sneers) and called it “Coulibiac”. He didn’t fool anyone.). I like Coulibiac as a buffet dish, as it can be quickly assembled compared to individual products, looks impressive, and cuts very nicely. The downside is that most examples I’ve had – including, I must admit, many of my own – tend to be rather on the dry side. That’s why I really like the addition of the fatty cream cheese and crab to yours. That may be a trick I steal if I ever have to make the larger version in the future. Damn tradition, full speed ahead! *sob* You know it, sister…. Wow, that sounds so good. Will be making it in a few days. Thanks. Hi. Happy New Year. This dish looks great and yummy. Look forward to trying it. Look forward to reading more of your posts. Oh my goodness Sally, I’ll be right over. These look delicious and I will definitely be making them. Oh man. The crab and cream cheese mixture with the salmon sounds amazing. And then you wrapped it in puff pastry. I’m now obsessed. I’ll take the extra hour of exercise. I’m so glad you couldn’t find the phyllo so that you could post this recipe again with all of your updates. 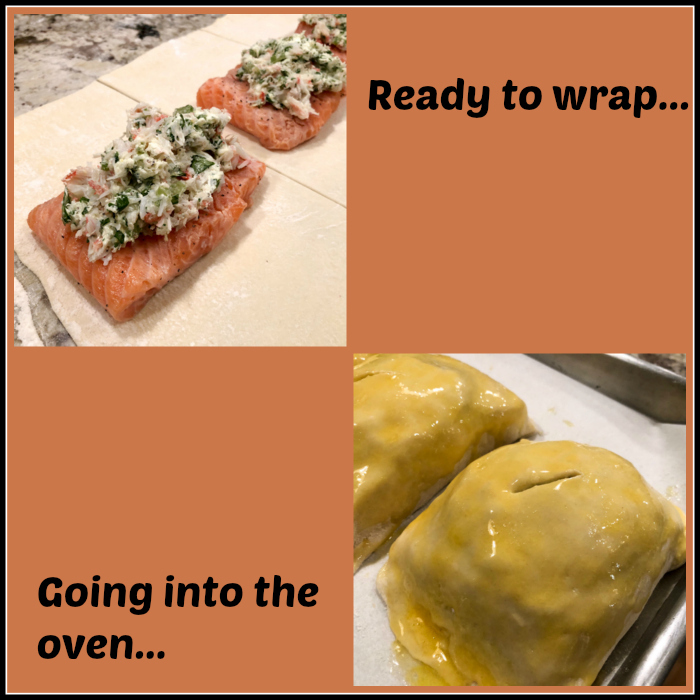 Now we have two salmon wellington recipes to choose from! These remind me of the salmon en croute that I used to eat and loved! It’s a happy reminder, even if I wouldn’t eat them now!!! I know what you mean, it did seem to be the in thing to eat at one point! I think my husband will think he’s died and gone to heaven if I make this for him! Keeping this in mind for sure, next time we have salmon. Oh Sally, this is another lovely dish. A true classic. This looks fantastic! It’s been on my list of things to make for a long time, but I need to first have more people around me who love salmon!!! 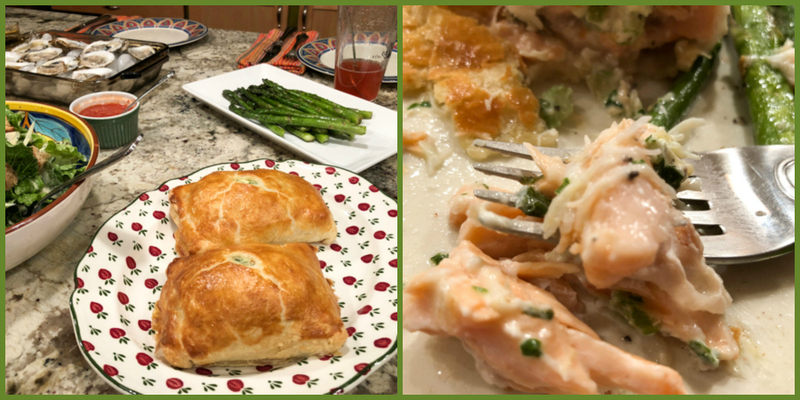 Salmon is not for everybody, unfortunately – I was not too wild about it, but Phil converted me completely – I did the same for him with goat cheese, now he seems to love it even more than I do… go figure it out! Enjoyed this recipe very much. Flavor was excellent, salmon perfectly cooked, beautiful presentation. One suggestion. Raise the baking temperature to 400 degrees. My oven temp was accurate but the puff pastry I used recommends 400 instead of 375 degrees. Mine looked a bit anemic and would have benefited by a higher initial temperature. The time suggested would be spot on at 21-25 minutes. I did add another element, however. Sautéed spinach (moisture pressed out) for the bottom layer. I also added a dusting of sea salt and fresh cracked pepper to the top of the pastry. We found a 6 oz portion of salmon too much and would cut it to 4-5 oz., especially if serving other sides. 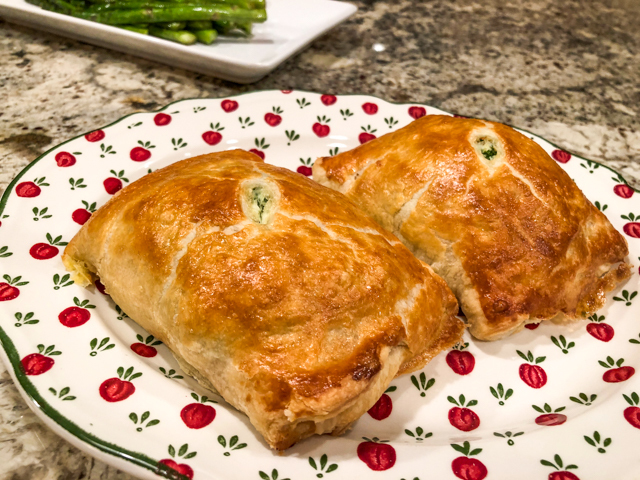 The beauty of this recipe is much prep can be done ahead with last minute wrapping in pastry, fast cooking and easy service. Great company fare for a crowd. Thanks for sharing! thanks so much for giving feedback! I had some of the filling left over so I used it to stuff my breakfast omelet. What a great tasting breakies that was!